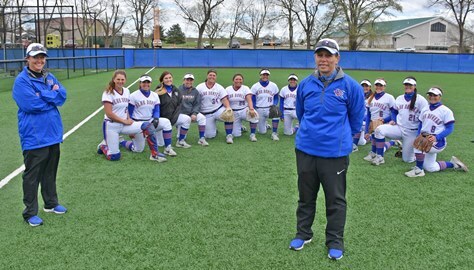 KCKCC coach Ross gets 600th win in sweep of Coffeyville – Welcome to Wyandotte Daily! Lana Ross reached another milestone in an illustrious coaching career Thursday. A 9-0 Kansas City Kansas Community College victory over Coffeyville in the first game of a Blue Devil sweep was the 600th win in Ross’ 15 years of coaching. The Blue Devils completed the sweep with an 11-5 nightcap win. The sweep vaulted the Blue Devils (10-4) into a tie with Cowley College for second place in the Jayhawk Conference behind Johnson County (12-2) heading into a doubleheader at JCCC Saturday at noon and 2 p.m.
Shay Grosstephan (11-4) allowed just three hits and retired the Red Ravens in order in three of the five innings in the 9-0 win. She struck out two and walked none and helped her own cause with a double and single and two RBIs. Alexis Rymer also had a pair of hits and drove in three runs while Alaina Howe doubled in two. 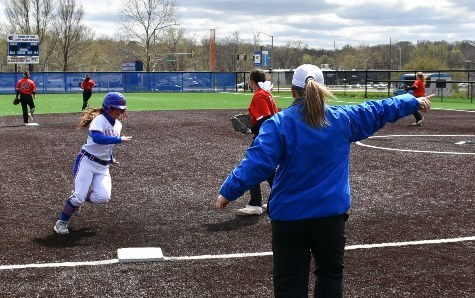 Leading 1-0, KCKCC broke the game open with three runs in the third and five in the fourth. A double by Devin Purcell and singles by Grosstephen, Rymer and Howe scored the three runs in the third. Britney Smith’s bunt single ignited the 5-run fourth. Hannah Redick also singled and after a throwing error, Grosstephan doubled, Kaylee Arnzen singled and Rymer singled in a pair of runs. The Blue Devils rapped out 13 hits in the 11-5 second game. Redick had two doubles and a single and Grosstephan drove in three runs with three singles to lead the way. Purcell and Arnzen each doubled and singled and Mackenzie Pinkerton and Howe both doubled to round out the 13-hit attack. Trailing 2-0, KCKCC went ahead 3-2 in the first on singles by Redick, Grosstephan and Rymer and a double by Arnzen and added three more in the second on just two hits, a double by Purcell and single by Grosstephan. Pinkerton doubled in a run in the fourth and the Blue Devils added three more in the fifth on a double by Redick and singles by Grosstephen and Arnzen. Pinkerton got her 12th win, scattering 10 hits, striking out six and walking four in a route-going effort.